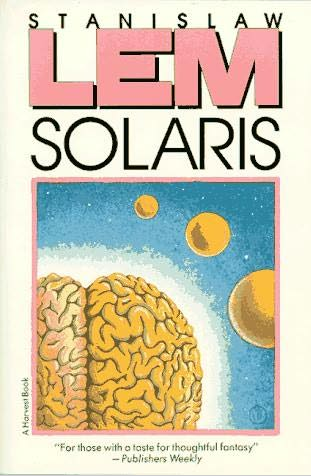 Stanislaw Lem is a cult Polish sci-fi writer from the 1960s, who has written some of the most intense and twisted books I’ve ever read about alien contact, with this one, Solaris, being the most famous and one of the best. People in America have heard of it because of the 2002 George Clooney film directed by Stephen Soderbergh. There’s also a very famous Russian adaptation from 1972 by director Andrei Tarkovsky. The book starts, as Lem books tend to, with a guy strapping into a one-man space pod and launching himself into the cosmos. In this case he’s Kris Kelvin, a psychologist, going to a research station on the planet Solaris. Things start to go wrong immediately, even in flight, when Kelvin’s capsule goes off course and the space station doesn’t answer his emergency call. He lands, and finds the place trashed. Of the three scientists aboard, one is dead and the other two seem to have gone insane…..
And where is this delightful creature, in relationship to our protagonist, Kelvin? Anyone wishing to avoid spoilers should stop here, and go read the book, which is terrifying and spectacular. Human scientists have been experimenting on the ocean for years, either without result, or with results they’re unable to acknowledge. The ocean has now decided to experiment back, by providing the human occupants of the station a near-perfect reproduction of the person they most desire, basically peeling out the nastiest inner layer of the subconscious, and making it visible. The love-creatures are superhuman, made of the alien substance, and display an imperfect grasp of personality. Lem is a hard-core gearhead, though, and he doesn’t care that much about love, desire or shame. The set-up is a device for a speculation on alien contact, on the theory that we can’t make contact because our selves, mainly our desires, will get in the way and blind us. This happens for political reasons—Kelvin discovers that evidence of previous experiments by the ocean has been dismissed—but mostly for psychological ones. There’s a thought-gulf too large to cross. Men, in their perversity and solipsism, desire alien contact, but only of the type that reflects them. The ocean, in Lem’s figuring, gives men just what they’re looking for. It’s a brilliant, fast, creepy read….. I highly recommend it. Wow, thanks for the post! I’ve had several Lem books around the house for a few years now, but have always avoided them because they looked too odd and even a little too intellectual (I have a Ph.D., but I still feel unequal to some books). But this sounds like a book I would enjoy, so I’ll try to get around to it some time soon. They are pretty odd and not the easiest read, but never for that “I am being deliberately intellectual and obtuse” way. Just odd because he’s an odd guy, the stories are odd. I actually prefer Fiasco to Solaris, but Solaris may have more human interest. Fiasco was one of the weirdest and most memorable books I’ve ever read.